One of the most loved Olympic events is figure skating – the jumps, the spins, and the oh-so beautiful dresses. This year is especially exciting for Brad Griffies, one of our customers at Atlanta Sewing Center in Duluth, GA. Brad, a former international skater and now sought after skating dress designer, used his BERNINA sewing machines to create the beautiful dresses that will be worn by four skaters competing at the Olympics in Sochi. Brad began making skating dresses when he was a skater himself. His grandfather sewed for his family, and Brad picked up sewing around the age of 13. At 15, he was making skating dresses for his fellow skating friends. Other skaters started asking where they got their dresses, and before long, Brad developed a strong clientele of skaters of all levels. He has designed dresses for skaters in the 2002, 2006, 2010, and 2014 Olympics. Brad’s most notable clients are 2006 World Champion Kimmie Meissner and 2014 National Champion Gracie Gold. Skaters have won their National titles wearing Brad’s designs from the US, Canada, Great Britain, Mexico, Puerto Rico, France, South Korea and New Zealand. 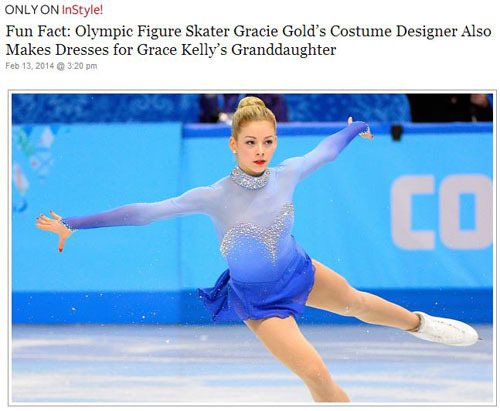 The stunning blue dress worn by Gracie Gold at the 2014 Nationals was created by Brad on his BERNINA. 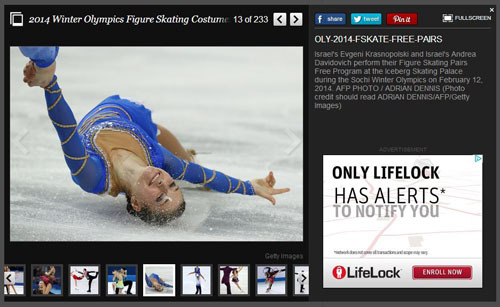 Click HERE to link to the InStyle article on Brad and his skating costumes. 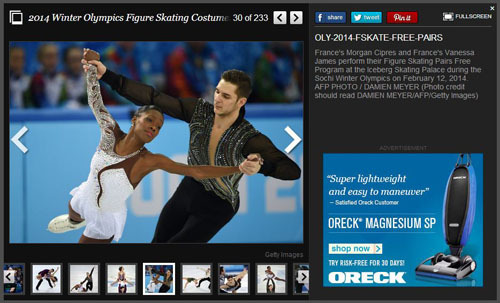 Click HERE and scroll to the bottom of the page for a slideshow of Sochi Winter Olympics figure skating costumes. Brad is a favorite in the skating community, well-known and respected for his beautiful dresses, gift of style, and talent in helping a skater select a dress that best suits their program and skating style. He is beloved by all for his gentle manner and easy smile. Click HERE to read more about Lauren Sheehan. After Brad began his ready-to-wear line of skating dresses a few years ago, he tried industrial machines but was frustrated by the lack of versatility. They only did a straight stitch or a zigzag stitch, and getting the tension perfect was a challenge. With his BERNINA machines, Brad can do everything, and “it just works!” He loves how easy the presser feet are to change. “The best thing about my BERNINA machines are how well they hold up. I’m not the average sewer! use my machines sometimes 8 to 10 hours a day, and have had my main machine now for 6 years. This is a home machine that has held up to my workload. I feel sorry for them sometimes with all the work I do on them, but they are like workhorses and keep going. I love them!” says Brad. Brad is a favorite customer among our staff at Atlanta Sewing Center’s Duluth store. As a figure skater myself – although not in the same level like you see at the Olympics – my dream is having a beautiful Brad Griffies dress… Just as soon as I lose a little more weight and get my loop jump!